You may or may not remember me mentioning that I'm taking Photography I this semester, but nevertheless I've finally started making progress and taking some pictures now that we're three weeks into the fall semester. I was actually really nervous to take Photography I. I'm a graphic design sort of girl - sit me in front of a computer and I'm yours. I even like drawing so set me up with an easel and some charcoal and we're all good too. I am not the type of girl you can hand a camera and shove in a dark room, so I was less than thrilled to hear from my adviser in the spring that I needed to start taking classes to qualify as my minor focus within art. Apparently my university art department requires you take so many classes in your major focus (for me - visual design) and a certain number of classes in a minor focus to complete your art degree. I contemplated taking drawing since I really do enjoy it, but the homework would be ridiculously time consuming and messy. I then thought about exploring printmaking, but the only section offered was at 8:00 in the morning. Homegirl does not function before 9:00 - so that was out. Finally, I was left with Photography, Ceramics or Painting. I settled on Photography since it seemed most applicable to my major. I was and still remain a little intimidated though. However, I think that's normal when you bleed over into other focuses. There are so many people whose major is Photography and who are so dedicated, passionate, and knowledgeable. Photography I is an introductory course that focuses primarily on black and white film development and I almost felt as if I were insulting them by signing up for a class when I had never dealt with film, didn't know the first thing about manually handling a film camera, and was absolutely 100% in the dark about the processes and procedures that happened within a dark room. I'm happy to report that we're three weeks in and it's not so terrible. I'm starting to dread the class less and be more inspired by it. My knowledge base is growing and that makes me so incredibly happy. It's rare to learn an entirely new skill-set when the majority of college classes feel like a regurgitation of information I've learned repeatedly over the years in some form or another (yeah, I'm calling you out science and history). But, to get back on track, I'd like to talk about the pieces I've decided to bring "out of the archive" even though they were only produced a few days ago. This week in Photography I we decided to experiment with self-made pinhole cameras. The process to make the cameras was relatively cheap and easy (maybe I'll share a little DIY as to how I made mine soon?) and it was fascinating to see the negatives develop. 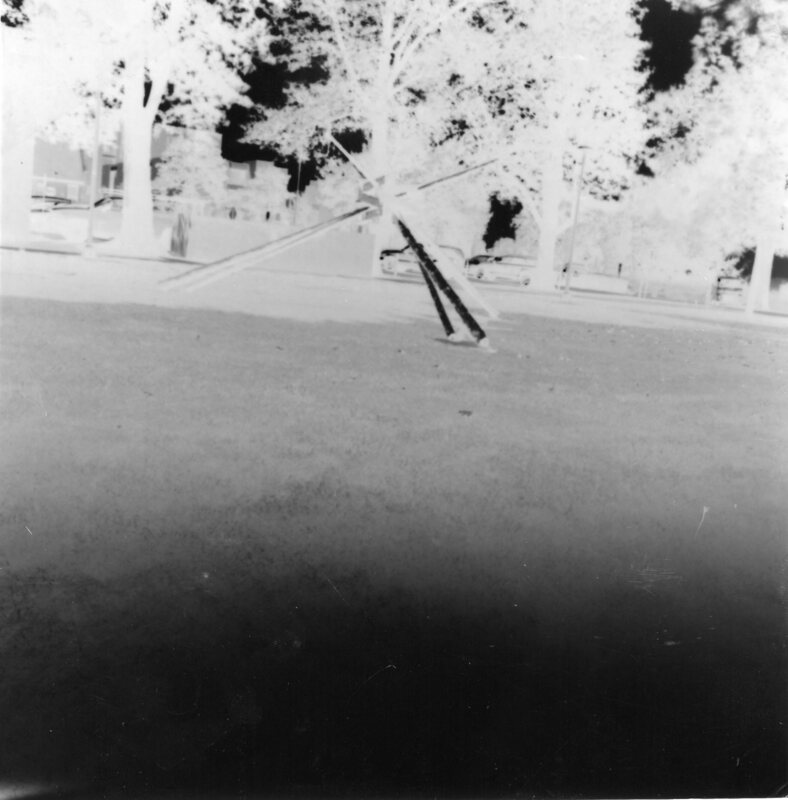 The bottom two images are two different negatives from the pinhole camera. The top image is a test strip positive of the bottom most negative image. 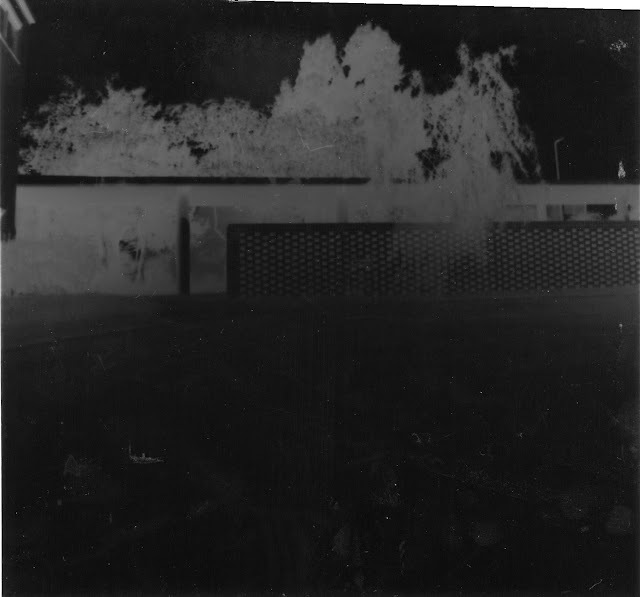 This test strip was the first negative I'd ever developed into a positive image. I was testing to see what exposure time I should use for my final image. We were advised to throw the test strips away once we determined the right amount of time, but I just couldn't bring myself to do it. It looked way too cool and I was too proud. Overall, a majority of my images developed less than stellar, but I have to remind myself that I'm still learning and to enjoy the process along the way. If you're interested in more, you can see more things I've brought "out of the archives" by clicking here.